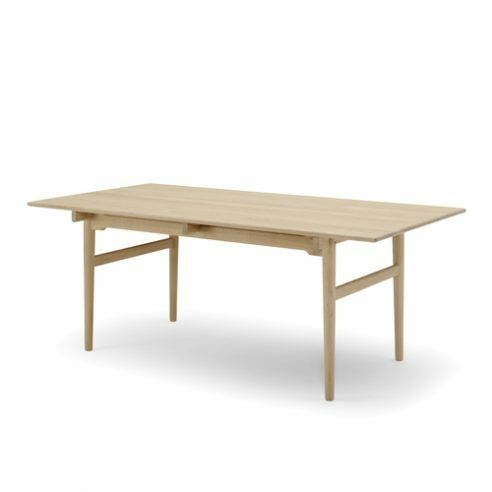 Originally designed as part of a series of tables for Andreas Tuck in the 1960’s, model AT327 was added to the collection of Wegner designs produced by Cal Hansen and Søn in 2011 and renumbered CH327. By using upright pieces of timber to create an apron beneath the table surface Wegner created the impression of the top hovering above the supporting frame. This effect is further enhanced as the horizontal rails are set in from the tables leading edges. These design details contributes to the overall lightness of Wegner’s design. The Wishbone chair produced by Carl Hansen since 1950 and Wegner’s original Chinese Chair designed in 1945 PP66 from which the Wishbone Chair evolved are two of many perfect choices for use around table CH327. Christensen. Christensen was an entrepreneur and salesman who dissatisfied with the quality of the furniture he was selling was inspired on seeing the Round Chair in 1949 introduced the young designer to five furniture producers who could produce furniture designed for mass production without compromising the quality of the furniture including table producer Andreas Tuck. Together they formed SALESCO comprising of Carl Hansen & Son who produced chairs, Getama upholstered furniture with timber frames, the upholsterer A. P. Stolen, Ry Møbler makers of storage units and Andreas Tuck the original producer of table CH327. SALESCO played a pivitol role in promoting Wegner and Danish design to an international audience only sold Wegner designs throughout the 1950’s and 60’s. The co-operation began with Wegner designing the then low cost, beautifully designed Wishbone or Y Chair for Carl Hansen and Søn.